I was anxious to try the Hydra-Calm Cleansing Gel and Hydra-Calm Global Protection Day Cream by Ren. 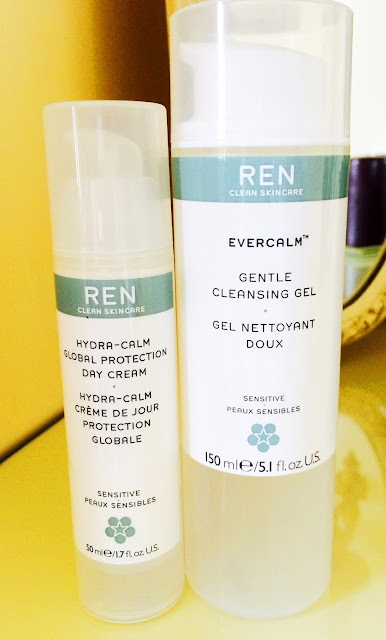 I had tried the Ren Beauty Balm and liked it a lot but wanted to give the sensitive skin range a go. Cloud 10 Beauty used to do a kind of tester box with 5 of the products from the range and I actually wanted to get that to try them out. Unfortunately it was out of stock when I was placing my order so I took the plunge and ordered the full size products. When I first used the gel cleanser I wasn't sure about the smell (I know such a small thing) but it was the first thing that hit me. With the balm I LOVED the smell of it, it reminded me of a beauty spa smell and I think I expected the gel cleanser to be the same but obviously with different ingredients in it, it wasn't. It had a very organic/clean kind of smell, not bad by any means just not what I expected. Now that I'm used to it I love it. And another thing I LOVE about this is that there are no synthetic perfumes added to it because a lot of the time that's what would make me have an allergic reaction. I use two pumps of cleanser to wash my face and it foams up really well so you could use it with a Clarasonic too (if you have one). Even though I have a Clarasonic I decided to just use the cleanser on it's own to see how it would perform. My skin, as I've said MANY times before is HYPER Sensitive and I also have a bit of Rosacea on my cheeks, so sometimes even things that are for sensitive skin can break me out or make me red. I'm glad to say this didn't. It's SO gentle on your skin but still makes you feel squeeky clean. It removes make-up gently but thoroughly and leaves your skin feeling soft and hydrated. I would recommend this product to anyone even if they don't have sensitive skin. Onto the Moisturiser. I'm sad to say this just didn't suit my skin. I wasn't allergic to it but I've found that my skin of late has been more sensitive/dry when before it used to be sensitive/oily and because of that after 3 days of use I started to get red dry patches along my jawline. Once I switched back to my old/regular moisturiser (Cetaphyl) the patches disappeared. If your skin is leaning towards being oily then this would be perfect for you. It just didn't suit my dryer skin at the moment. When I was younger and had really oily but still really sensitive skin it was very difficult (make that impossible) to find something on the market that my skin didn't react to because all the products for oily skin were so harsh. THIS would have been perfect. I will definitely be trying it out again when my skin goes through it's oily phase which still happens every now and then. I hope my thoughts on these products helped you if you were thinking of trying them out. Like I said above I got mine on Cloud 10 Beauty. They're a really good Irish website where you can find products that aren't easily available in the shops here in Ireland. What I love as well is that you get free samples with your order and what's better is that you can choose your samples. With my order above I got 3 frees samples. Here's what I picked out. I am IN LOVE with the sigma brush. Such a handy size for my handbag! I have since ordered my second bottle of Ren Cleansing wash and also a Ren Mask that I wanted to try. So l'll let you know what I think of the mask after I've used it a few times.